Hero Histories: Before Percy Jackson was...Nature Boy! Before Percy Jackson was...Nature Boy! Rich teenager David Crandall was yachting with his parents when a storm sank the boat and David was stranded! David used his new powers to return home and reunite with his still-alive family. He also decided to battle evil in various forms as Nature Boy, since he controlled the forces of nature, and the gods gave him a spiffy new outfit to show off! He only had three issues of his own title (which started with #3*) before he disappeared from the comics scene..until now! But, within those three issues, the seeds were planted for an entire superfamily of Nature-heroes including Nature Man (an adult version of the hero from the future) and female counterpart Nature Girl. This isn't surprising, since he was created by Jerry Siegel (co-creator of Superman) who knew a thing or two about that sort of thing. To add to his hero cred, Nature Boy was drawn by the great John Buscema who later did Conan , Avengers , Fantastic Four , and damn near everything at Marvel in the 70s thru the 90s, so even if the stories were a bit silly, they looked spectacular! 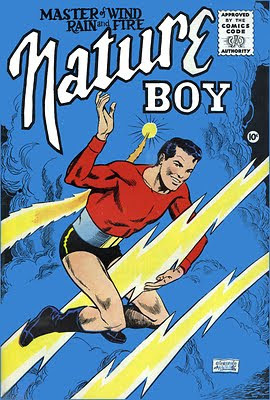 Technically, Nature Boy should be considered one of the first Silver Age heroes as his premiere was in 1956, just a couple of months before The Flash re-emerged in Showcase #4 , but, like Captain Flash, and even the Martian Manhunter, he's thought to be one of the last Golden Age characters instead! On that basis, we at Atomic Kommie Comics™ have revived Nature Boy as part of our Lost Heroes of the Golden Age of Comics™ line, on t-shirts, messenger bags, mugs and other kool kollectibles! It's unlikely that Alex Ross will include him in Project SuperPowers , but we felt he was worth re-presenting to the comics world, even if it's just on tchochkies! *To save money on paying for a new second-class mailing permit, comics publishers would often just rename an existing comic, rather than start a new one! Today, with #1 issues being such "hot" collector's items, publishers wouldn't dream of doing that sort of thing! THE Clean-Cut, All-American Navy Hero! The LAST Tale of the Golden Age Black Cat!